The Warecase eXtended Task Manager (XTM) is a powerful auxiliary tool designed for simplifying the environment of the software developer. XTM is an extended windows task manager and performance monitoring tool for virtually all newer versions of Windows and can give fast solutions for sudden problems which may arise in a product's functioning. The Warecase eXtended Task Manager (XTM) is a powerful auxiliary tool designed for simplifying the environment of the software developer. eXtended Task Manager 2.15 is a shareware program and can be used as a demo to try the software until the free trial period has ended. A full version of the program is available after the trial period ends. 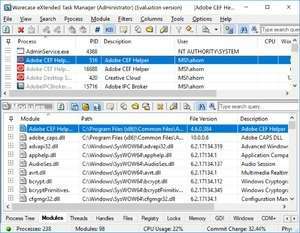 For security reasons, you should also check out the eXtended Task Manager download at LO4D.com which includes virus and malware tests. Additional screenshots of this application download may be available, too.